By definition, an occultation is the passage of one astronomical body directly in front of another so that, as seen from an observer on Earth, the further body is hidden from view. The word “occult” means “to hide”. Observers in the Occultation Section of the SPA, for the most part, observe and record the passage of the Moon as it occults the brighter stars and planets. Accurate timings of these events are made which can then be sent to the various Occultation Timing Agencies. There is also scope within the Section to observe and record the occultations of stars by other bodies such as the planets, their satellites and asteroids, although these are much rarer events. Details of occultations that are due to take place in the near future are listed in the Sky Diary, Popular Astronomy, and on the asteroidal and lunar prediction pages of this Section. Further details about these events, and how to observe and record them, are also available from the Section. The asteroidal events Asteroids, and the latest lunar occultation events Lunar, are now available to view. The Section is supported by the Section Director, Mell Jeffery, and Assistant Director Jon Harper. 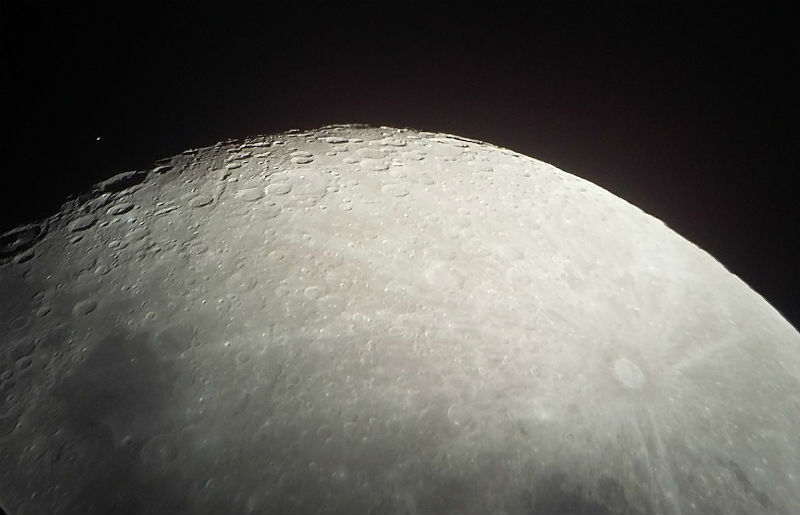 If you are successful in observing an occultation event, then please do come and share your observation with us, either by emailing your report to occultation@popastro.com, or by reporting your observation on the SPA’s on-line Observing Forum. A personalised list of occultation events, for stars down to magnitude +10, for your location, can also be obtained by sending an email request to occultation@popastro.com. If you wish to receive email alerts when the next occultation events are scheduled to take place, then please send an email requesting this. The photograph at top right was taken by Bertrand Thooris and Philippe Vercouter, from Palingbeek, Belgium. It was taken during the total lunar eclipse of November 9th 2003, and shows a magnitude +7.6 star shortly after the Moon had passed by close enough for the star to appear to have “grazed” the edge of the lunar disk. All content copyright the Society for Popular Astronomy. Founded in 1953.